> Roundbuzz > SMS Marketing Re-invented? Introducing Location SMS! SMS has continued to skyrocket in consumer adoption. However, many businesses are hesitant to use it as part of their marketing mix because they view it as another, more expensive push marketing channel. However, when coupled with location information, SMS can re-invent itself as a truly powerful in-bound marketing channel with measurement and analytics that are expected by digital marketers. 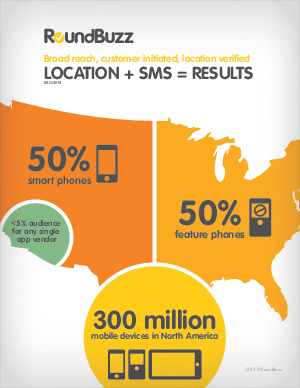 Additionally, location based SMS does not require a mobile application. It therefore is available to all your customers delivering tremendous reach. Learn how location SMS can help you engage your customers, real time, when they are at your place of business. Read actual case studies that show how businesses incorporated techniques such as in-store offers, and text check-ins, to encourage customer frequency and to drive in-store behavior.